The holidays are the most wonderful time of year in Waterbury unless you are staring at a to-do list a mile long and wondering where you are going to find time to do everything. The stress from the holiday season can take away a significant amount of holiday cheer and can cause sleepless nights. To take the side of Pollyanna, sleepless nights guarantee that you get to see the holiday light displays in all their glory. However, less sleep can cause more stress and the vicious cycle continues. 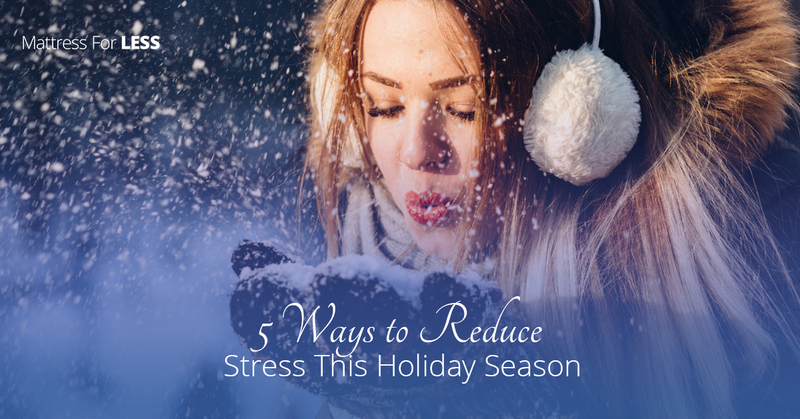 To fully enjoy this season and to get the rest you need, try these five tips to combat the holiday stress. It’s easy for the hurriedness of the season to wear on a person and to find oneself holding your breath or even hyperventilating. The best solution when you are starting to freak out about all the things that you haven’t done or all that is going wrong or could go wrong is to pause your day and take a couple deep breaths. Taking a few deep breaths will help you to calm your mind and have a clear headspace to think about the rest of your day. It’s easy to have an idea in your head about the perfect meal, gift, or Christmas. However, perfection is in the eye of the beholder and it is severely overrated. If you tend to put too much pressure on yourself, take a moment to decide what is a necessity and only attempt the other if you have the time and energy. Also, remember that other people don’t tend to see the imperfections that we do and most likely won’t know that you didn’t accomplish x, y, or z. As the saying knows, what they don’t know, won’t hurt them. Making a list can be a great way to look at all that you have to do in a manageable way. You will see each thing as a separate item, not just a big impossible glob of things to do. Make a list of the things that you have to accomplish and a list of the things you would like to get done. Prioritizing will help you parse out all the items in your to-do list, get all that you need to done and will reduce your stress. Also, it is incredibly satisfying to see items checked off a to-do list. Don’t forget to delegate and have grace for yourself. It’s easy with all the goodies of the season to feast on sugary treats and other savory snacks that taste wonderful, but give you every little nutritional value. Often stress, sickness, and a lack of sleep can be attributed to a poor diet that is rich in sugar and caffeine and generally devoid of the nutrients that our bodies need and crave to function properly. Having a balanced diet will help you handle your stress and sleep better. It’s easy to get caught up in all the little details of the holiday season and overwhelm ourselves with everything that the holiday season is not about. When boiled down, the holiday season is about spending quality time with those that mean the most to us. Most would say that what they truly want from this season is to not be alone and to spend time enjoying all that the season has to offer with those they love. Gifts are nice, but optional. Decorations and light displays are beautiful, but not a must and nineteen different types of cookies are a yummy treat, but definitely not a requirement. As you enjoy this holiday season with family and friends, be sure to eliminate as much stress as possible and if stress isn’t the answer to your sleep problems, consider investing in a new mattress or pillow! Often old mattresses can cause sleep problems and pillows that have seen better days can be the culprits of sore necks and backs. If you feel like it’s time for a new mattress, head down to Mattress for Less in Waterbury. We would love to help you find a mattress that will have you snoozing instead of counting reindeer.